One stop, two years: What’s next? 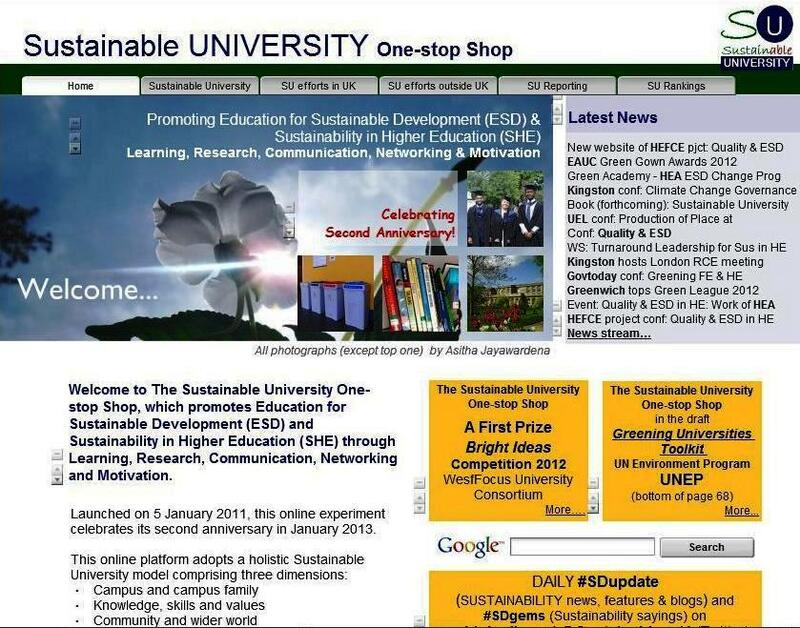 The Sustainable University One-stop Shop celebrated its second anniversary in January 2013. Since its launch on 5 January 2011, it has promoted Education for Sustainable Development (ESD) and Sustainability in Higher Education (SHE) through an integrated approach comprising learning, communication, networking and motivation. Developed entirely using free web resources (free website builders and social networking), this website has grown over the past two years from a single website to a suite of websites, comprising six satellite websites around a central platform. I seek a host university to implement my Sustainable University Integrated Solution (SUIS) research and development / business model which I have built upon the knowledge and experience gained from my Sustainable University One-stop Shop experiment. If you are interested in implementing my SUIS R&D/ business idea, fully or partly with appropriate modifications to suit your institution’s requirements, please do not hesitate to contact me on asitha_jayawardena@yahoo.com to discuss it further. Asitha is an innovator who is EDUCATED in Education for Sustainability (London South Bank University), Green Buildings and Civil Engineering (University of Moratuwa, Sri Lanka), SKILLED in research, writing and the arts (poetry, painting and photography), and EXPERIENCED in sustainability research and communication in corporate, social enterprise/charity and academic contexts, in the press and online. Having submitted his dissertation as a course requirement of the MSc programme in Sustainability, Environment and Change at Kingston University in December 2012, he seeks a SUSTAINABILITY-related opportunity in Higher Education, Media, Business or Charity sector, particularly an integrated endeavour like his Sustainable University One-stop Shop experiment.